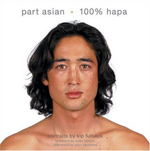 kip fulbeck: part asian, 100% hapa is an exhibition of portraits by artist Kip Fulbeck, who traveled the country photographing more than 1,000 Hapa of all ages and walks of life. Originally a derogatory label derived from the Hawaiian word for half, the word Hapa has been embraced as a term of pride by many whose mixed-race heritage includes Asian or Pacific Rim ancestry. Fulbeck’s work seeks to address in words and images the one question that Hapa are frequently asked: "What are you?" By pairing portraits of Hapa–unadorned by make-up, jewelry, and clothing—along with their handwritten statements on who they are, Fulbeck has produced powerful yet intimate expressions of beauty and identity. kip fulbeck: part asian, 100% hapa is an artist's attempt to explore Hapa—who now number in the millions—and it offers a complex perspective on an increasing reality of contemporary America. Organized by the Japanese American National Museum, the exhibition was on display at JANM from June 8, 2006 through October 29, 2006. Kip Fulbeck is an award-winning photographer, filmmaker, writer, and spoken-word artist whose work has been exhibited worldwide. He is professor and chair of Art at University of California, Santa Barbara. The companion book, Part Asian, 100% Hapa features a foreword by Sean Lennon, an afterword by Paul Spickard, and is published by Chronicle Books. For more information about this presentation, contact 713.496.9901 or visit their website at asiasociety.org/texas. The exhibition is made possible, in part, by the support of Mariko O. Gordon & Hugh Cosman, The James Irvine Foundation, and Wells Fargo. JANM . Last modified Nov 19 2012 9:32 a.m.